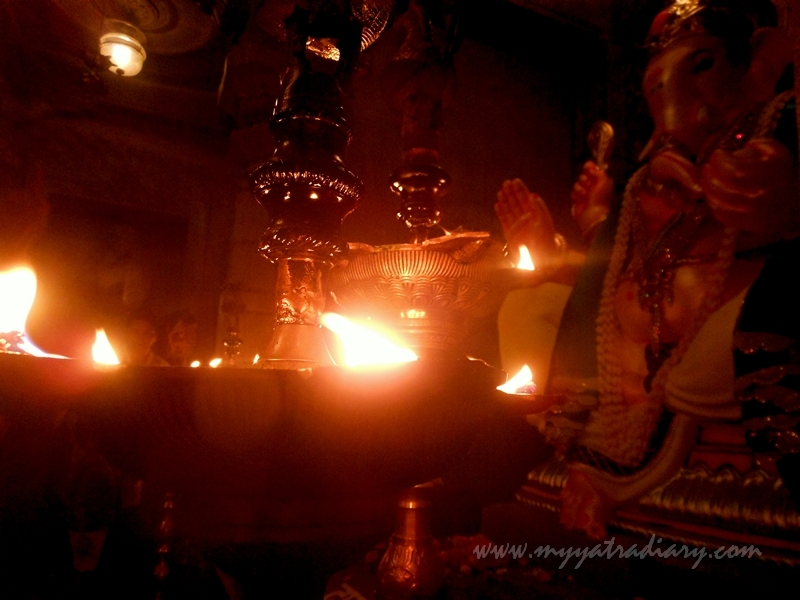 Ganesh Chaturthi Pandal Hopping: Day 10 || Ganesha in the Kedarnath Temple of Uttarakhand! After visiting Ganesha as Andhericha Raja in Kunkeshwar Temple, Devgad, are you ready to travel over to Kedarnath Temple in the land of the Lords, Uttarakhand? Ganesh Chaturthi Pandal Hopping: Day 10 || Ganesha in the Kedarnath temple of Dev Bhoomi Uttarakhand! Amongst one of the chaar dhams in India (besides Badrinath, Gangotri and Yamunotri) and one of the most revered holy shrines of the Hindus is Kedarnath. Situated at the base of the snow clad majestic Garhwal Himalayan range and facing the fascinating Mandakini valley, the temple is one of the twelve jyotirlingams dedicated to Lord Shiva built in the 14th century. 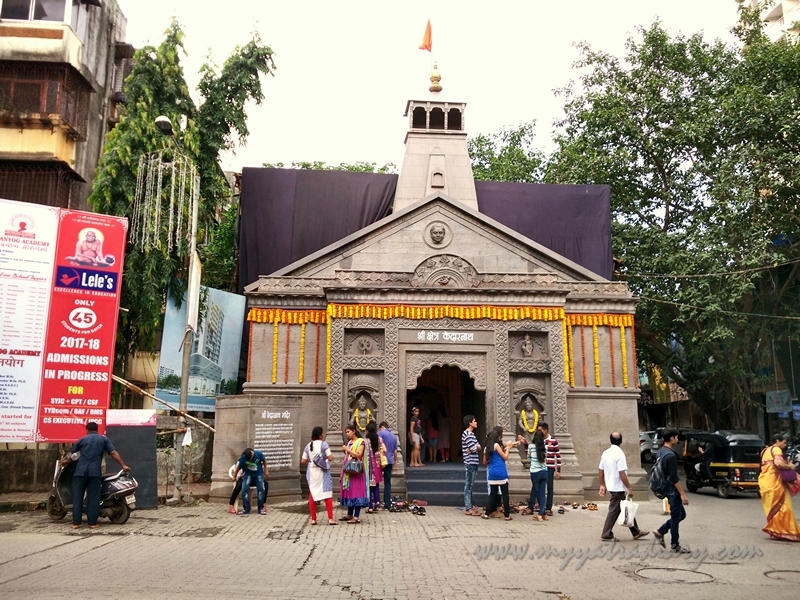 This year, as part of my Ganpati pandal darshan, it was a delight to find Lord Ganesha seated at the holy shrine of Kedarnath bang in the middle of a busy and chaotic western suburb of Mumbai. The exterior is black in colour and though there is nothing ornate about it but one glance at the structure and the resemblance to Kedarnath Temple strikes you - if you can tune your mind out of the honking of all the traffic and the heat outside, you may as well be led to believe that you are in devbhoomi Uttarakhand! 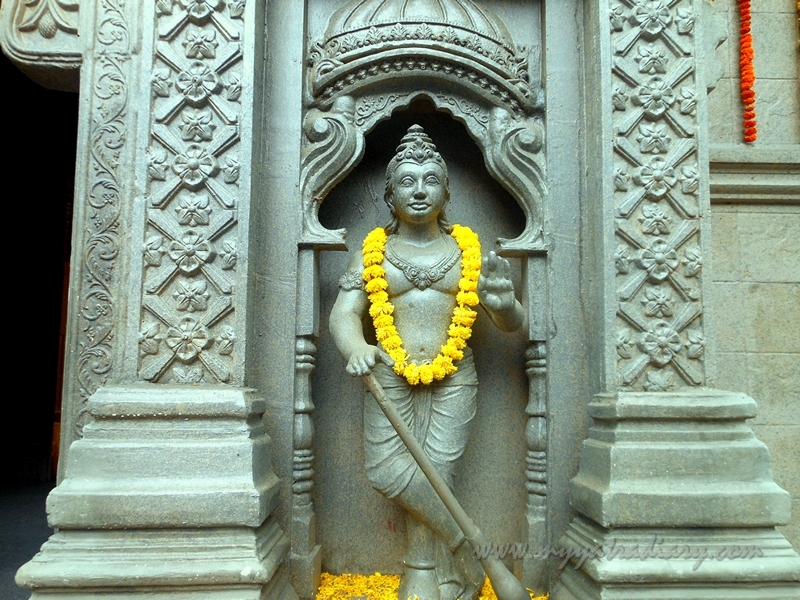 The temple is believed to have been built by the Pandava brothers to atone for their sins after the battle of Mahabharata. Devotees are required to trek the last 15 kms. to reach the shrine from Gaurikund onwards. But here, you can come walking, or in rickshaw or by train. 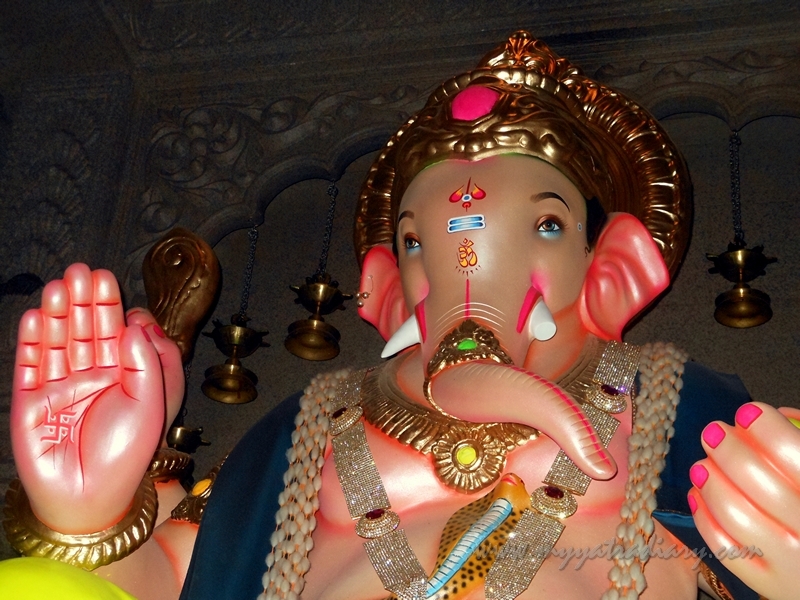 Bappa makes it easy and accessible for everyone who wishes to see the temple. You step in and you step in awe! There is a Nandi bull just at the entrance which leads to the main pandal where Lord Ganesha sits with His Father, Lord Shiva. 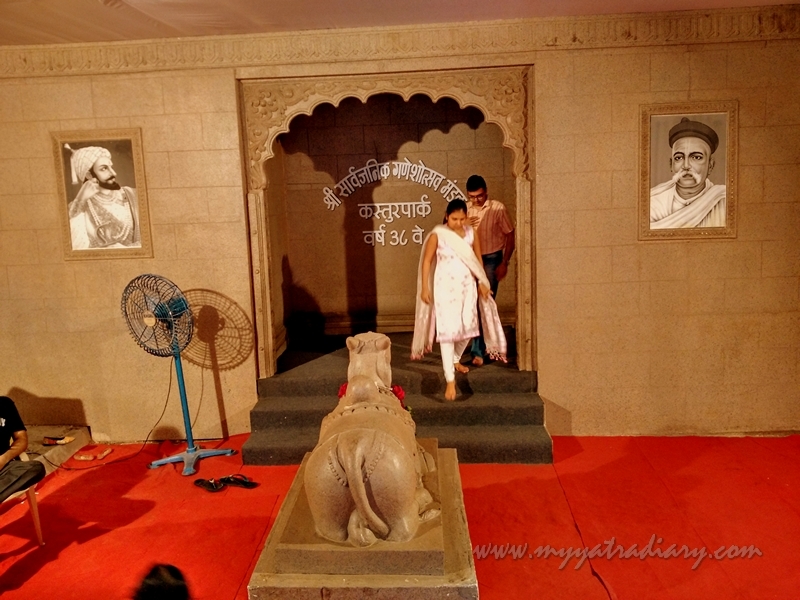 The interiors of the main pandal are dimly lit adorned with spectacular sculptures and figurines all around. And all this is made in paper, cardboard and thermocol - it's hard to believe! 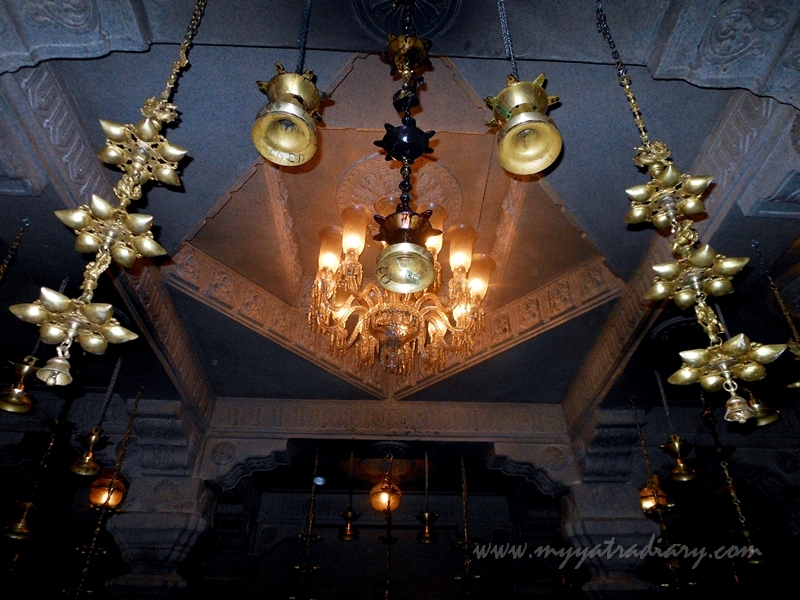 Deepmalas hanging from the ceiling accentuate the divine aura that permeates the entire precincts. 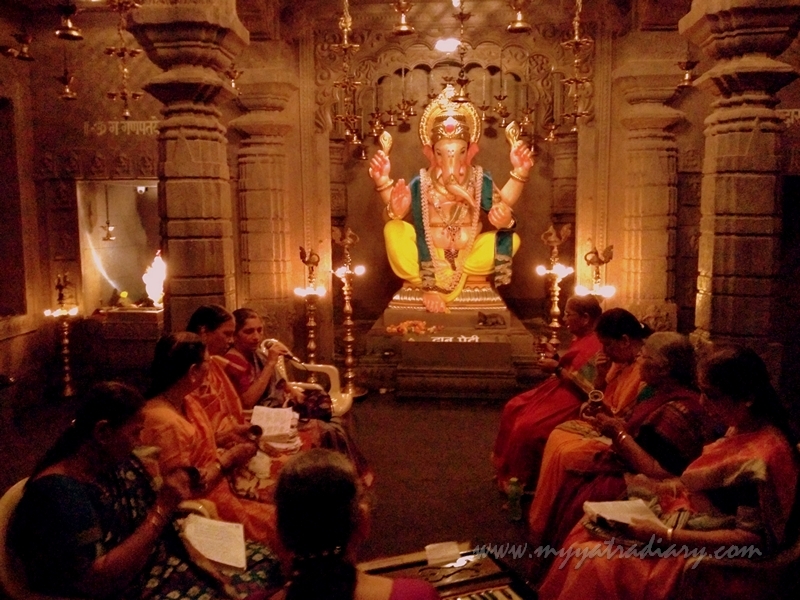 The atmosphere is charged with devotional fervour today: A group of around 10 women sit right in front of Bappa singing songs and glories to the Lord. As my camera works overtime, their music makes Ganesha - the deity of arts and culture, come alive! There is intensity and depth in their expression of love, the ecstatic mood raptures my soul and soothes my senses. 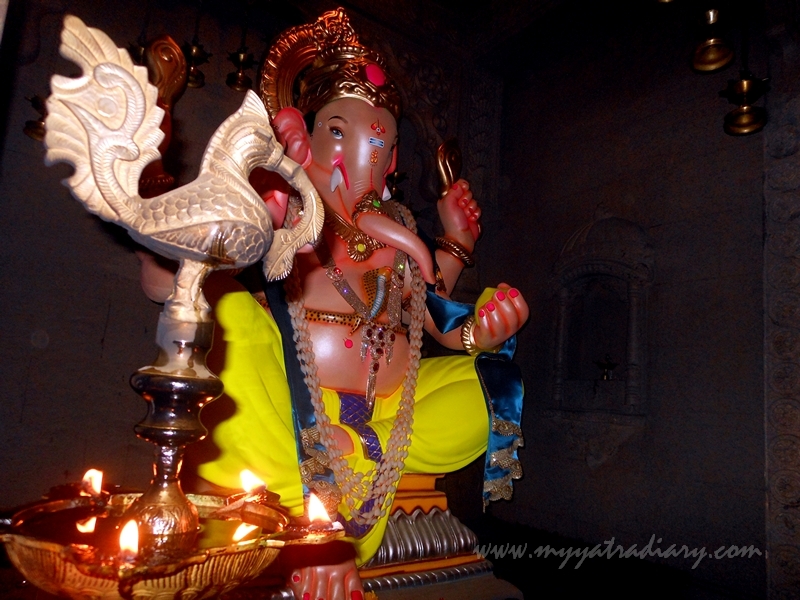 In the garbha griha is our beloved Lord, Ganesha sits with a lovely smile beaming on his face. As if in appreciation of all the love that is showered on him, as if in a trance. 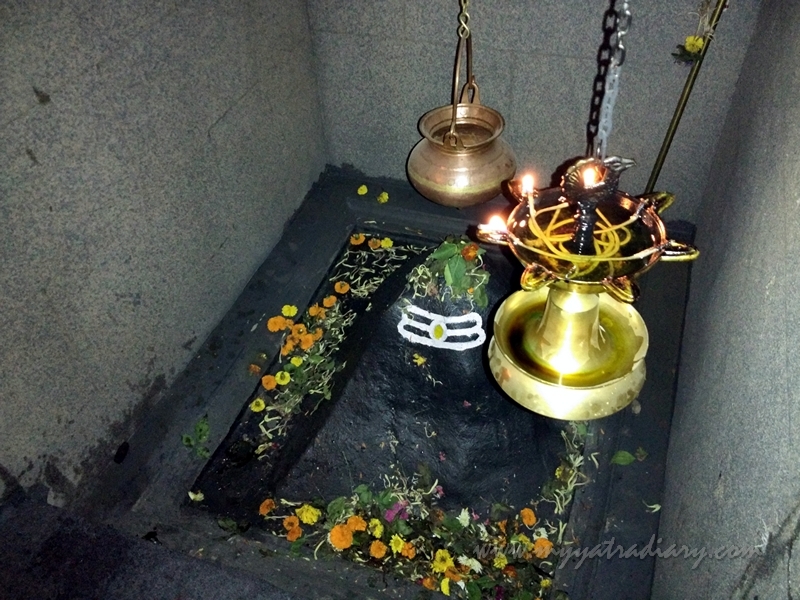 He sits happy flanked by His Father on one side - the Jyotirlingham – an irregular shaped conical rock worshipped here as Lord Kedareshwar. 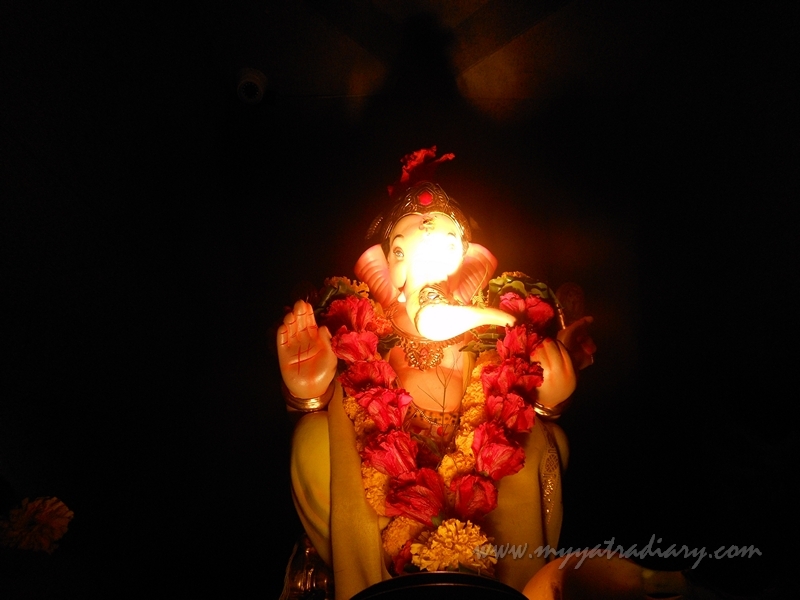 And on the other side by the baby Ganpati, haloed and enlightened like a truly celestial being. for all the days to come! Devbhoomi has so much to offer. This was nice too. I can't believe how beautifully and stunningly you have got this images captured. They are simply amazing. 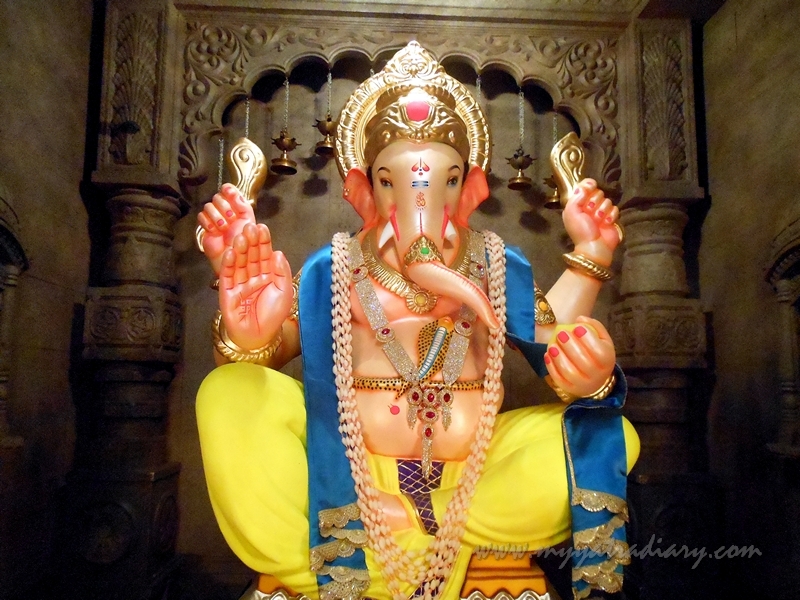 Once again this post about Lord Ganesh Chaturthi overwhelmed me. A part of the reason may have to do with how everything changed about the way I looked at the world after I stayed for that hour of 'Sandhya Aarti' in Siddhi Vinayak temple, with tears rolling down my eyes half of the time the whole divinity was enchanting everyone. Thank you Arti for posting this. The place and the pandals do strike a distinct fond memory. Enjoyed reading this, very nicely covered. A lovely post.Thanks for sharing! Such a beautiful post, Arti with some amazing pictures. Quite an informative post with heart-conquering pictures. Bingo !